Modern Australian Outback Enhances Outdoor Living Experience by Davis Architects. Imagine living the fantasy of dominating your own estate, coupled with an outdoor recreational space that offers a generous amount of sunlight, accessible views of handsomely cultivated plants and trees, and balmy breezes blowing through your hair. 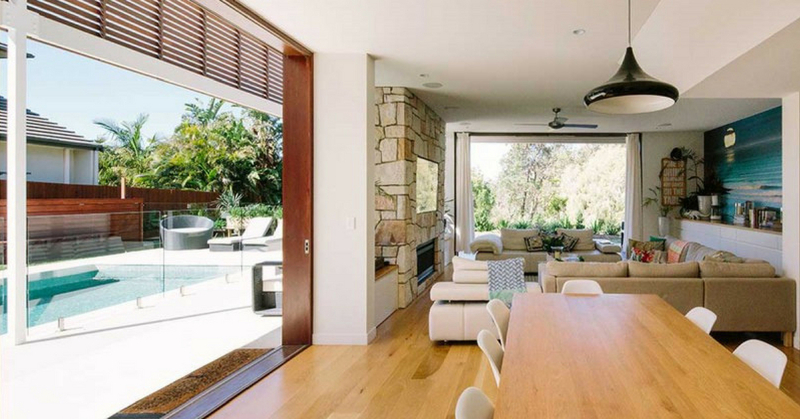 Situated at Byron Bay, Australia, comes the latest in homes that weave the outdoors with the indoors, and draws out the best of both worlds into one. With polished, clean lines brace integrative, stylish colors. The wide, tall floor-to-ceiling windows shade half of the ground floor, opening out to the pool and entertainment areas that bring a vibrant and lively tone to captivate the surrounding scenes. In the incredible sub-tropical weather, this 2-in-1 outdoor-indoor living concept carries the most weight in the main component of the whole design. This compound houses 2 structural residences, holding 4 bedrooms on one side of the manor and a 2-story guest house on the other. Materials are most favorably sourced locally, ranging from the hardwood, screens, timber, and sandstone which are all prominent elements featured in the design. Highly endorsed for any beach lovers, this house will strike your feelings right where you desire it the most, while you indulge yourself in the cool breezy winds and untangle with the sizzling sunrays on your very own part of the beach. A creator who naturally goes against the grain. Uses her innate ability to understand and deliver upon the most complex and mysterious of her clients' wishes, resulting in a professionalism and elasticity in producing a punctual and tenderly-crafted product. A long-time lover of manga, anime, and seeker of quality lai cha. Anthropologie Debuts Weather-Resistant Outdoor Furniture Collection!